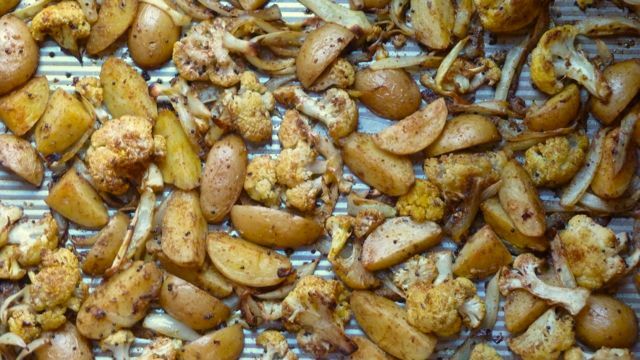 This year I’ll start with roasted potatoes, but change them up by adding an unexpected sprinkling of Indian spices and cauliflower—what I call Roasted Aloo Gobi (in Hindi that’s potatoes and cauliflower). My version is far from traditional. Then, for a completely different riff on sweet potatoes, I’ll toss together a bowl of nutty, whole grain farro with the orange roots (roasted), plus sweet-tart pomegranate seeds and healthy, darling-of-the-moment, kale. 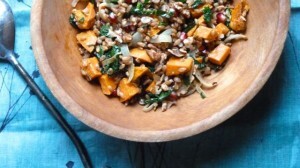 I contributed this recipe to the food blog, Food52, last winter, and it’s been hugely popular there, featured in a recent article on kale and another on sweet potatoes. Salad-wise, the last glorious persimmons from our tree will add vibrant color to the bowl tossed with peppery arugula, toasted pepitas and tangy goat cheese. And since there are never enough side dishes on the holiday table, I’ll add some quick, pan-seared brussel sprouts, too. 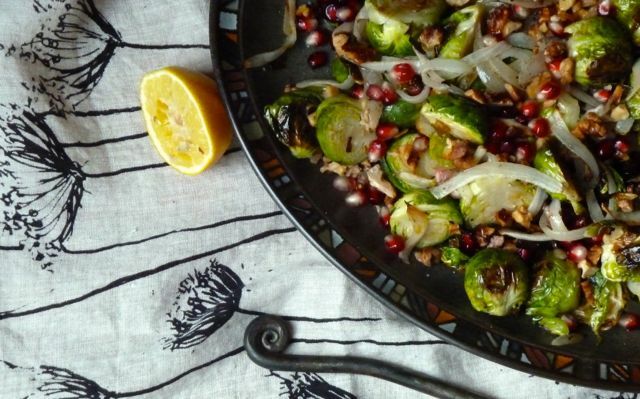 All you need is a pile of brussel sprouts, olive oil, salt and balsamic vinegar. Cut the stems off the brussel sprouts and place them in a pan of boiling water for no more than one minute (if you’re feeling lazy you can skip this step—you’ll just end up with crisper brussel sprouts). Immediately remove from the pan and bathe in ice water to stop the cooking. When they have cooled to the touch, drain and cut the brussel sprouts into halves. Warm a large skillet over medium-high to nearly high heat (choose a pan that’s wide rather than deep, with ample surface area for browning). Once the pan is very hot, drizzle a tablespoon or two of oil across the surface, making sure it’s nicely coated. Add the sprouts in a single layer. If you have more than can fit in the pan without crowding, cook in batches (crowding interferes with browning). As the vegetables hit the pan you’ll hear them sizzle. Resist the urge to turn for at least a minute or two. You want them to take on loads of deep brown color—even blacken a bit. You might think they’re overdone, but in fact the deep color is what gives this dish its flavor, so refrain from turning these vegetables much as they cook. Test a piece for doneness by stabbing with a fork—the brussel sprouts should be tender but not overly soft. Turn off the heat, and drizzle with high quality balsamic vinegar and sprinkle with coarse salt. For something a bit fancier, toss with a few toasted nuts—pecans would be nice. By the way, these sprouts are fabulous with a drizzle of soy sauce and rice vinegar instead of balsamic (skip the salt). Happy Thanksgiving. May your table be surrounded by family, friends, happiness and, of course, home-cooked food. 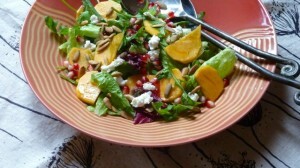 This entry was posted in Journal and tagged Thanksgiving, vegan by Four Cooking Together. Bookmark the permalink.